April Fools' Day has passed, but it's always useful to be reminded that things are not always what they seem, and what we think we know isn't always true. But we've already discovered a way to vastly increase average life expectancy: it's called public health. Kennedy quotes Dr. Thomas R. Frieden's Shattuck Lecture published in The New England Journal of Medicine: "Since 1900, the average life span in the United States has increased by more than 30 years; 25 years of this gain have been attributed to public health advances" such as immunization mandates, clean air and water regulations, and restrictions on the places where people can exhale cigarette smoke into other people's faces. (Frieden notes that "Tobacco use is still the leading underlying cause of death in the United States and worldwide.") So as Kennedy writes, "Today, the greatest threat to your life span may be the Trump administration’s assault on public health and medical research. . .When it comes to staying alive, we’re all in it together." A group of friends notifying insurance companies about their cultivation of healthful habits. 2. And when it comes to staying insured. . . The New York State Department of Financial Services has found in a recent investigation that insurance companies are mining your Instagram feed to glean information about your habits. As Nathan Heller writes in Why the Life-Insurance Industry Wants to Creep on Your Instagram (New Yorker), insurers use this information to create models and algorithms that "purport to make predictions about a consumer’s health status based on the consumer’s retail purchase history; social media, internet or mobile activity; geographic location tracking; the condition or type of an applicant’s electronic devices (and any systems or applications operating thereon); or based on how the consumer appears in a photograph." Think twice before posting those Coachella or Burning Man pix. . . 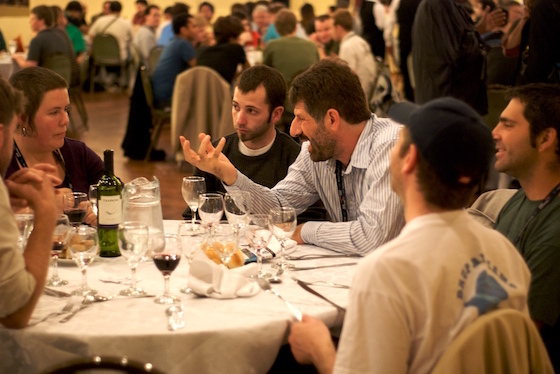 Speaking of oversharing, we've all heard highly personal conversations held in public. But there's more at stake than embarrassment. Kate Klonick, a law professor at St. John's University, gave her students A 'Creepy' Assignment: Pay Attention to What Strangers Reveal in Public (New York Times). 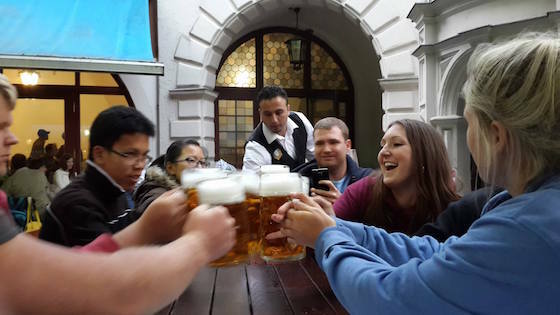 She tasked her students with identifying someone in public using only clues from what they said loudly enough to be heard by lots of people, logos and monograms visible on their clothes and belongings, and Google searches. It's shockingly easy: one student was able to find a stranger’s full name, college major, minor and year of graduation based only on someone addressing him by his first name and the college logo on his shirt. And some folks are just oblivious. A student reported overhearing someone recite "their entire credit card number while on a full train over the phone." And a reply to Klonick's Twitter thread about the assignment recalled a time at a Starbucks where "this dude was having like a fight with his accountant or something [more likely his bank or credit-card company]. Kept, loudly, repeating his SSN and full name on the phone. After the third time I wrote it down, and handed it to him." We reveal private information to the strangers surrounding us because of two expectations. First, we assume anonymity in public, and paradoxically the more crowded a place is the more anonymous we feel. Second, we think we're protected by our own obscurity. But neither expectation holds when public spaces are being increasingly monitored and everyone is carrying around a powerful recording and searching device. For those of you who think, like some of the students in Klonick's class, "I don't care if anyone's watching, I have nothing to hide," you may be surprised at what you can inadvertently enable someone to discover. Instagram (now owned by Facebook's Mark Zuckerberg), Google, and other culture-changing tech companies like Apple and Amazon have been founded and sustained by entrepreneurs with "limited social skills, a willingness to obsess and an interest in systems." As Matt McFarland's Washington Post article Why shades of Asperger’s Syndrome are the secret to building a great tech company notes, these traits are often considered essential to their success. After Asperger's doctoral thesis was rediscovered and translated into English in 1991, he was hailed in some quarters as a pioneer of neurodiversity. But as Michele Pridmore-Brown writes in Unfeeling Malice (London Review of Books), her review of Edith Sheffer's book Asperger's Children (Norton, 2018), "whether autism is one condition or several, it remains steeped in the cultural values of its Nazi origins, and in the idea of the model personality: obedient, animated by collective bonds, socially competent, robust in mind and body." Those who were autistic did not fit in with the group-oriented ideal. 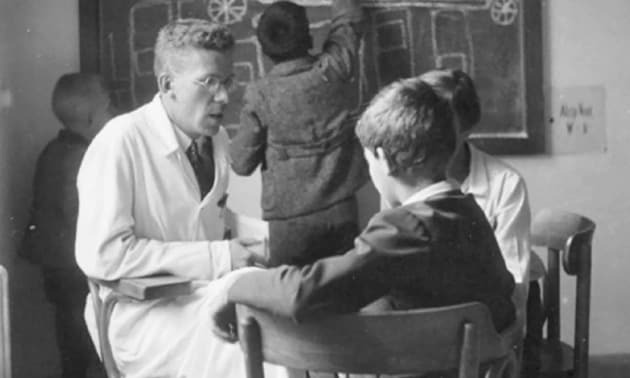 When the Jewish and liberal doctors were purged from the Children's Hospital after the Anschluss, the psychiatrists who remained knowingly participated in the Nazi eugenics program. While eugenic ideas did not originate with the Nazis, after the Anschluss they took on a lethal significance. Those children who were diagnosed with a failure to conform to normative neurological standards and who were deemed to lack compensating "special abilities" were sterilized, became the subject of gruesome medical experiments, or were sent to Spiegelgrund, "the children's killing centre" that was part of the Steinhof mental hospital. Asperger used his "autism spectrum" to separate children into "favorable cases" and the "ineducable." 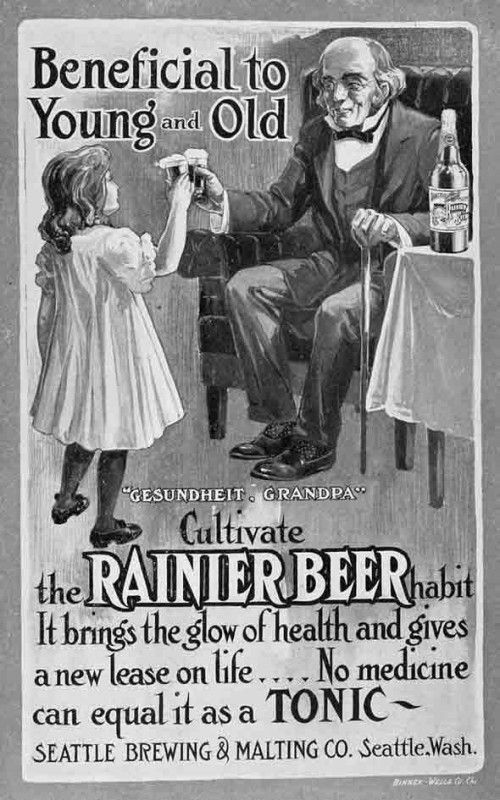 He sent the latter—many of them adolescent girls he found unruly, rebellious or precociously sexual—to Spiegelgrund, with the full awareness that they would be murdered by the injection of a fatal overdose of barbituates. Those with Asperger's Syndrome (no longer recognized in the American DSM) are said to experience little pleasure from social interactions. At the least it's ironic that "limited social skills" are now considered a desirable condition for those who are creating the online platforms through which we increasingly conduct our social lives. 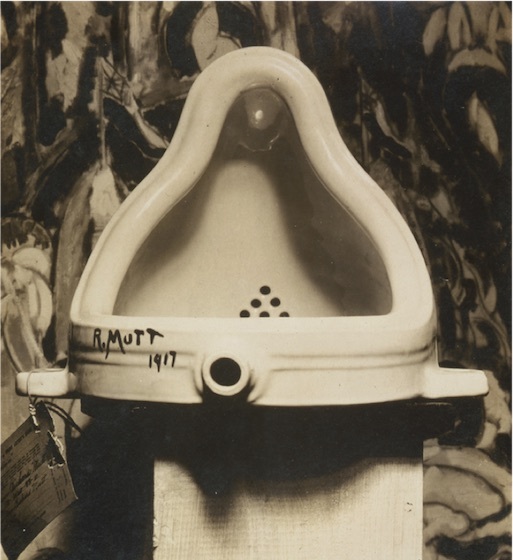 Of course, the most famous work of readymade art is Fountain, a urinal set on its back and signed "R. Mutt 1917." 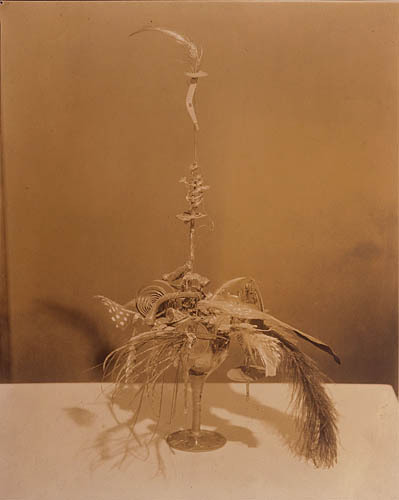 Submitted to the American Society of Independent Artists exhibition, it later wound up on display at Alfred Stieglitz's gallery 291, where it was photographed by Stieglitz. 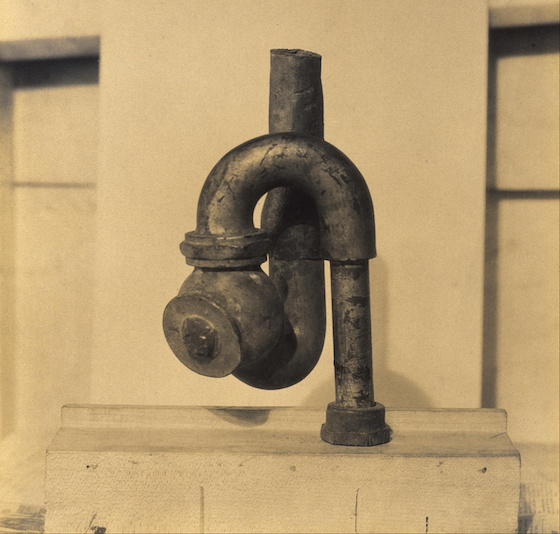 The original disappeared at some point, and in the 1950s and 60s Duchamp created and sold sixteen "replicas" (the model of the urinal was different). In 2004 a poll of 500 British art professionals named Fountain as the most influential work of modern art. Portrait of Marcel Duchamp by Elsa von Freytag-Loringhoven, 1919. Photo by Charles Sheeler, ca. 1920, from Francis M. Naumann Fine Art. But what if Fountain wasn't by Duchamp? 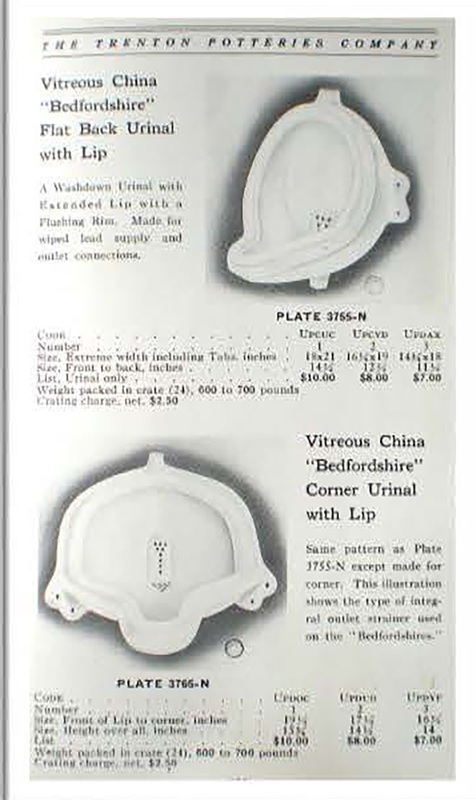 As novelist Siri Hustvedt notes in her article A woman in the men's room (The Guardian), in 1917 Duchamp wrote a letter to his sister in which he stated, "One of my female friends who had adopted the masculine pseudonym Richard Mutt sent [in] a porcelain urinal as a sculpture." The woman who had adopted the name Richard Mutt was Elsa von Freytag-Loringhoven. 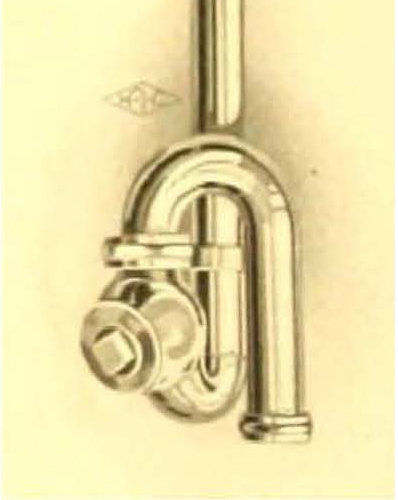 In early 1917 she was in Philadelphia; as Dr. Glyn Thompson has discovered, the plumber's trap used in God was sold by the Haines, Jones and Cadbury plumbing supply company of that city. Plate H-3274 of the Hajoca Pocket Price List, 1910, cropped, rotated and inverted. Plates 3755-N and 3765-N from the Blue Book Catalogue of the Trenton Potteries Company, 1915. Trenton, N.J., is approximately 30 miles from Philadelphia, and surely Philadelphia plumbing supply houses would get their stock from conveniently located local manufacturers. 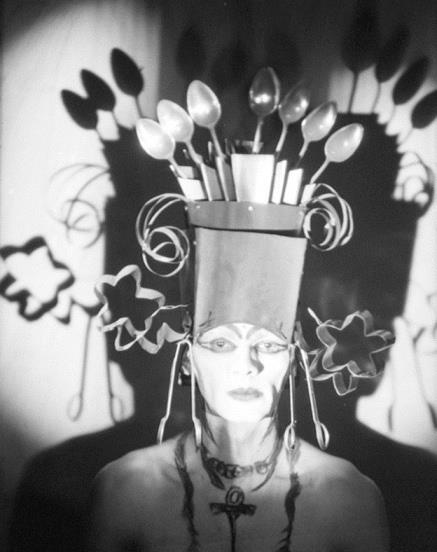 Thompson, in his post "Only in Philadelphia" on the MooreWomenArtists.org site, adduces additional evidence that the creator of Fountain was Elsa von Freytag-Loringhoven. By the time Duchamp started authorizing Fountain "replicas" in 1950, Elsa had been dead for more than two decades. In December 1927 the gas in her Paris apartment was left on overnight, whether deliberately or by accident. She was only 53. Perhaps someday she will receive the credit she deserves for her pioneering art—including the single most influential work of the 20th century.